Get ready for an explosively honest, super-simple party game where friends get to answer weird and wonderful questions about each other. Learn more than you probably wanted to know and laugh harder than you probably thought you would. Truth Bombs is a laid back game full of laughs and fun facts about your friends and family. Learn all about the hidden things about each person. Learning how to play is easy and quick with very little strategy involved. 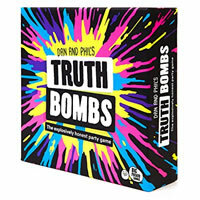 Check out this great party game and purchase your copy of Truth Bombs today. Have the most points at the end of the game to win. You get 140 question cards, 160 player sheets, 7 neon mats, 8 pencils, a score pad and the official Truth Bombs game rules and instructions. Please keep in mind that the official Truth Bombs party rules and instructions could be different depending on the game version you have. The rules below are some of the exact directions on how to play Truth Bombs. Share with us your comments, funny stories, tips, advice, strategies, creative ways to play, questions about how to play, problems with the rules or anything you want about Truth Bombs. All submissions will be reviewed within 24 hours. Click here to add your Truth Bombs comments.